Review: The Beach Boys, 'Made In California' In 2012, the band became another rock group that was celebrating its 50th anniversary. This year, it released Made in California, an eight-hour, six-disc retrospective of their career that, perhaps inadvertently, shows how this once-great force in American popular music faded from public view. The Beach Boys in 1964. 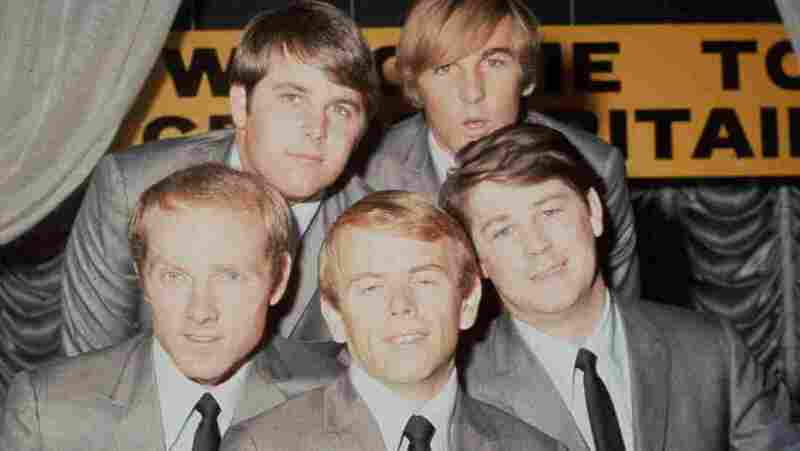 Top row: Carl Wilson, Dennis Wilson. Bottom row: Mike Love, Al Jardine, Brian Wilson. All it takes is two seconds of hearing "Round round get around / I get around" and you're there — in the sun, on the beach, in the '60s. The Beach Boys vaulted up the charts while branching out from surf music to psychedelia. This year the remaining band members released Made in California, a six-CD box set loaded with outtakes and other rarities. Critic Ed Ward examines the rise and long decline of a beloved group with a unique sound. The early Beach Boys story is pretty well known: The three Wilson brothers — Brian, Carl and Dennis — were music-crazy, and lived near the Pacific in Hawthorne, Calif. Dennis loved surfing; egged on by their father Murry, a failed musician, they made a record in 1962 with one of their cousins, Mike Love, and a friend, Al Jardine. Surfin' was released on a local label. With Murry's help, the boys got a contract with Capitol Records in Hollywood, which had ultramodern recording facilities, a great studio and musicians who could be called in to augment The Beach Boys' modest instrumental skills. Their musical skills, honed by Brian, became incredible. The Beach Boys took everyone by surprise. They didn't fade away with the surf craze: Brian had his finger on the teenage pulse, and the music also celebrated motorcycles, girls, cars, girls, school and dancing — with girls. It was hard to go wrong, especially with the group's vocals and Brian's writing and arranging skills. Between 1962 and 1965, The Beach Boys charted 22 singles, nine of which hit the Top 10 and two of which topped the charts. The group started 1966 with a stumble — an odd song called "The Little Girl I Once Knew," which hid an ambiguous story behind an upbeat melody — but quickly went back to the top with an arrangement of an old calypso tune. Brian Wilson had left the touring group by 1965 and was hard at work on an album that was like nothing anyone had ever made before, let alone a surf band. When Paul McCartney heard Pet Sounds, he realized how much the ante had been raised and went back to London to start making Sgt. Pepper's Lonely Hearts Club Band. By the time Pet Sounds was finally mixed to Brian's satisfaction and released, he'd already started on the next album, Smile. It would become his undoing, ending in number of acrimonious conflicts with the band, an album unfinished, and Brian Wilson retreating to his house, where the word got out that he'd suffered a nervous breakdown. Eventually, an album called Smiley Smile emerged with a hit song, "Good Vibrations," which had been recorded before Pet Sounds was even finished. Brian continued to contribute to the band, but its next album — 1968's Friends — was, to put it mildly, uneven. The title track was a collaboration between the Wilson brothers and Al Jardine. When Brian stepped out solo, though, it got a little weird. "Busy Doin' Nothin'" was quite an apt title for his rambling bossa nova. Fortunately, Dennis and Carl were slowly coming up with some good material. Dennis's "Slip On Through" emerged from the 1970 album, Sunflower, and at least integrated some contemporary flavor into the Beach Boys' formula. But with very few exceptions, the 1970s were a creative disaster for the band as it swung from hippie-ish meanderings to painfully crafted songs of nostalgia. Their only Top 10 record in the whole decade was a cover of Chuck Berry's "Rock and Roll Music." Brian's well-publicized problems eventually receded. And yet, although the Beach Boys had made the leap from a fad to a vehicle for serious work, neither Brian nor anyone else — Dennis died in a swimming accident in 1983 and Carl of cancer in 1998 — could turn them into anything but a nostalgia act, which, sad to say, is pretty much what they became.